The definitive tool for regularity rally & raid racing. All the control in your iPhone, iPod or iPad. There's simply not a better system. Use it as an advanced speed table with your odometer or as an independent precision system with the separately available precision sensor. Main screen designed thinking in the optimization and clearness of all the information needed by the co-pilot. 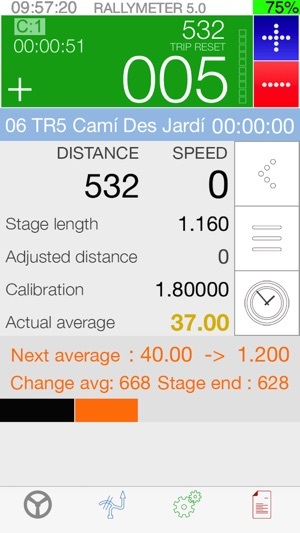 Stage data, distance travelled, average changes, adjustments, advises and much more … Using the tool with the optional sensor we will be able to have the exact distance of delay or advance with background color change to simplify the reading. • Ideal distance visor with chronograph of stage elapsed time. • Accessible buttons to correct distance adjustment. • Stage details before starting stage. • Manual or automatic start for exact start time. • Actual and next average information. • Distance and time to end of stage. • Advanced/delayed distance display with background color help. • Up to 4 different calibrations that we can even change during a stage. • Progress bar to graphically see the stage evolution. • Reverse mode to be able to subtract distance if we get lost. 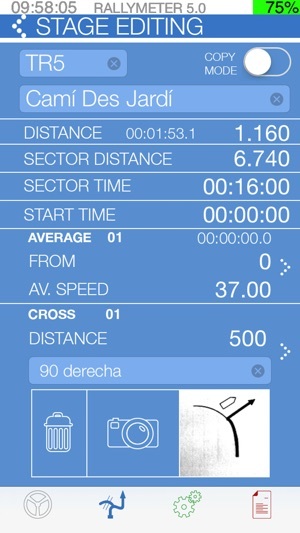 • Odometer mode that will show us clearly the distance and elapsed time so we can read the data to use when there's a stage with defined passing times. • Adjust distance button to set the distance at any time. • Possibility of inserting or delete stages. 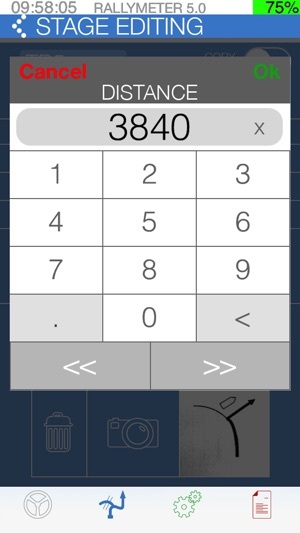 • Improved interface for faster and easier data input. 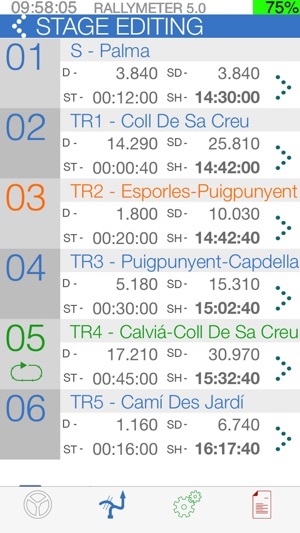 • Entering sector distances and time we will be able to follow the average from stage to stage. • Up to 99 averages for each stage with 2 decimal precision. • Cross or references advise programable per stage that allows to have the navigation information and that can also help to adjust distances in the stage. In the settings tab we define the app functions and we can also access to extra items like the new and powerful pilot mode. • Almost all the parameters are fully configurable to our needs. • Delayed start to allow stage start if we arrive late. • Manual or automatic navigation advises popup close. • Manual end of stage allows us to exactly know the distance we have at the specified end of stage by pressing a button. We won't need to stop at the end of the stage to check precision. • Start times automatic calculation. • Up to 5 decimal calibration value with a new interactive calibration system that makes it unique and simple. 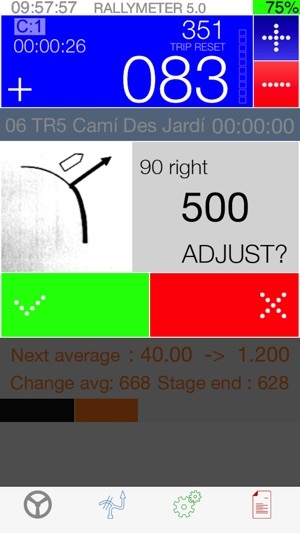 • Up to 4 calibrations that we can change during stage if we need to. • Wireless sensor control with signal level. • Copy/Paste stage mode to complete the track stages or stages were we need to copy the first lap. • Pilot mode (*) allows to have 2 devices connected, one in the hands of the co-pilot with the usual operation and a second device with only the info needed by the pilot: advanced/delayed distance, actual speed, elapsed time and elapsed distance for a comfortable navigation in the stage or between stages. This information is shown in big digits with background color change. Buena pirámide aunque le falta, una aplicación para que se pueda hacer el cambio de media también en referencia(por una señal de trafico, hito kilométrico,etc) y no solo en distancia. A veces los organizadores de rallys de regularidad están combinando las dos opciones para igualar los que van con este tipo de aparatos y los que van con las pirámides clásicas. Así que a trabajar para la próxima versión. Muy útil aplicación para Rallyes de Regularidad. Ha mejorado mucho con las últimas actualizaciones.